Quality Matters! Ready to Deliver? Three young researchers from Bangladesh have set up a simple yet unique measure of organizational capability; the capability to deliver quality products and services to its customers. Sayeda Ismoth Iqbal, Mohammad Rajib Uddin and Samin Ishraq Siddiquee in their new research paper titled “An Essay on the Potential for Successful Adoption of Quality Assurance Practices at Ispahani Islamia Eye Institute and Hospital” look at the issue of quality from a totally new perspective. This research, which has recently been carried out in a 60 year old eye institute and hospital in Dhaka, the capital city of Bangladesh, examines whether organizations have reached a point in their life cycle which supports the implementation of a Quality Management System. The authors introduce a solution in the form of a simple and inexpensive yet effective measure for gauging organizational preparedness for the implementation of a Quality Management System; a model which they have termed the “Quality Triangle;” the result of which spells explicit instructions and demarcations for any organization planning on introducing a Quality Management System. The model revolves around the evaluation of the organizations strengths in special criteria which the authors have identified, and justified as well, to be of significance to any organization which is desirous of mapping quality through a formal system. 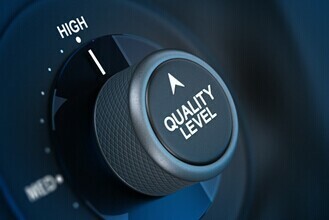 The authors claim that the Quality Incline is for all organizations, regardless of industry or position in the supply chain. According to co-author Syeda Ismoth Iqbal, organizations may use this model to gauge their preparedness at any time, and as many times as needed, until the organization reaches a stage which is at the feasibility threshold of Quality Management System implementation.